Random vegetable soup | suppertime! 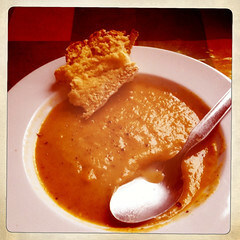 My sons described this as ‘the best soup’ they had ever tasted – and it was just made with stuff I had lying around. Fry the onion in a bit of olive oil, then add the veg and fry until starting to go soft. Add the stock, some salt and plenty of black pepper. Simmer for about 40 minutes and blitz with a hand-blender or in a Magimix. Serve with freshly-baked soda bread. This entry was posted in carrots, potatoes, pumpkin, soup, vegetables and tagged soup, vegetable soup. Bookmark the permalink.